A very emotional day in court as Jordan Miles took the stand to share his story with the jury. Dozens of Jordan’s supporters once again packed the courtroom. Jordan would spend six-and-a-half hours recounting how undercover officers jumped out at him, leading to a severe beating simply for walking down the street from his mother’s to his grandmother’s home. Jordan would tell the jury how, upon his 18th birthday, his life and a very bright future lay ahead of him. Following the altercation with officers Sisak, Saldutte, and Ewing, his life would become full of uncertainty, depression, isolation, and flashbacks. “When you make music with people, it’s one of the greatest feelings in the world,” Miles would tell his attorney Joel Sansone. “When was the last time you played the Viola?” Sansone would ask his client. “Not in over a year.” Miles testified. “Will you ever play again?” Sansone asked? “Someday, when [the trial] is all over, whether it ends good or bad, I will once again pick up the things I once loved… I just want to be normal again,” Miles told the court. Sansone would ask his client about the altercation with police in great detail, throughout direct examination. “They never said they were police officers, I didn’t get off the ground, I never got off the ground,” Miles told the jurors. “Every time I lifted my head, I got beat… One of the men choked me and told me to shut up,” Miles said, as he uneasily recounted the events of January 12, 2012. Jordan further testified that when one of the men (he still didn’t know they were officers) asked where his money was, he told them that he doesn’t carry money but just had a birthday and would go home to get his money for them if they wouldn’t kill him. When he finally saw uniformed officers arriving, Miles was relieved. He testified that he thought he was being saved because someone heard his cries for help and called the cops. “I was very confused when I was arrested. I did nothing wrong. These three men beat me up, It was them who should’ve been arrested,” Miles testified. Miles would go on to testify how his life has changed since the incident with police. His grades went from A’s and B’s to C’s and D’s. Miles would keep having flashbacks of the beating and isolated himself from friends and family. He doesn’t want any publicity, or talk about/relive the events. Miles would testify it would be a year to two-and-a-half years after the incident before he began to feel somewhat normal again. 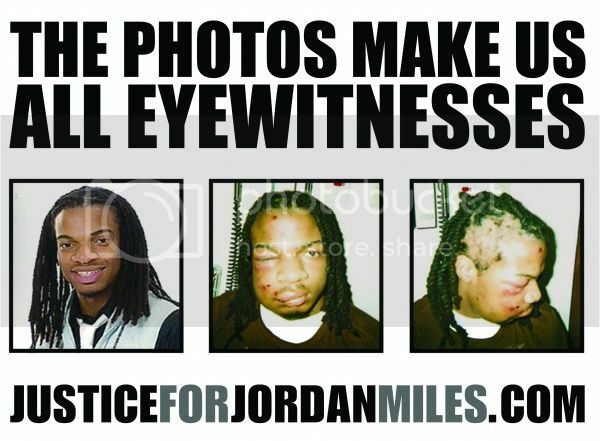 Jordan would inform the court that his health insurance ran out and he wasn’t able to afford medical attention in the years following the incident with police. Sansone would ask Miles if he believed his job at the CVS pharmacy to be his life’s work. “No, I wanna go back to college, get into realty, and go to a trade school. Learn carpentry and plumbing,” Miles replied. During the lunch break media briefing, attorney Joel Sansone reiterated how his client had been wronged. Following Sansone’s statements, Saldutte attorney Bryan Campbell boldly asked media if they wanted to “hear the truth,” prompting a verbal lashing from Channel 11′s Alan Jennings. In their cross examination, the defense attacked Jordan’s credibility because he couldn’t fully remember what he was doing on his birthday on January 11, 2010, and on the night in question. James Wymard would attack Jordan because Jamiah Anderson—Miles’ girlfriend at the time—testified they were on a triple date on the 11th, while grandma and mother Miles testified they had birthday cake at the grandmother’s home sometime on the night of the 11th. Wymard would throw Jordan’s FBI statement in his face. Jordan informed the defense that his statements to the FBI weren’t accurate, completing the circle of everyone who testified and claimed their FBI statements weren’t accurate. Wymard would continue to attack Jordan because he had no homework on January 11 or 12, 2010, and spent a great deal time playing video games for hours on both days. Wymard would then question Miles’ statement in a complaint lodged with Pittsburgh’s Citizen Police Review Board. Wymard continued to try and portray a situation in which Miles’ version of events keep changing with each trial or statement. The day ended with Lawyers in chambers, keeping comments to themselves, meaning a possible gag order has been issued. Jordan will resume on the stand Monday with more cross examination from defense attorneys.